My typical workflow for developing with AEM frequently involves reading from logs. Whether it's for checking if bundles and services installed, following the logging of custom code or trying to get a full stack trace of an error, the logs provided by AEM are an invaluable tool. Until now, this has meant switching back and forth between my IDE (Eclipse) and the terminal. Dual monitors and Total Terminal help, but it's still not as efficient as it could be to keep switching back and forth. Last week, I decided to see if this was a way to make this better. The most obvious solution was to make my logs visible inside Eclipse, so I started looking at the Eclipse Marketplace. There are a number of plugins, and after some testing, I settled on LogViewer as it was fairly simple, but had all of the features I wanted. 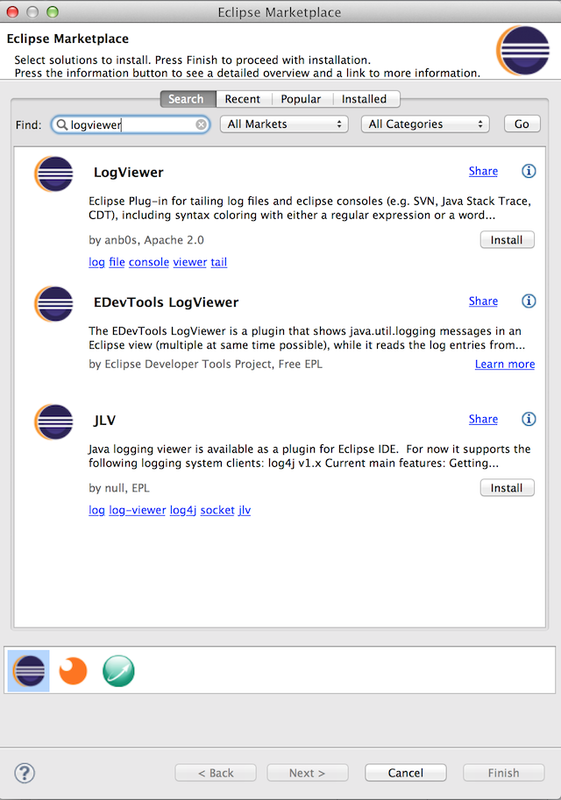 Installing LogViewer is pretty simple as it's available in the Eclipse Marketplace. Simply search for LogViewer and follow the wizard through the installation. Make sure to accept that you are installing unsigned code and then restart Eclipse when the installation is complete. 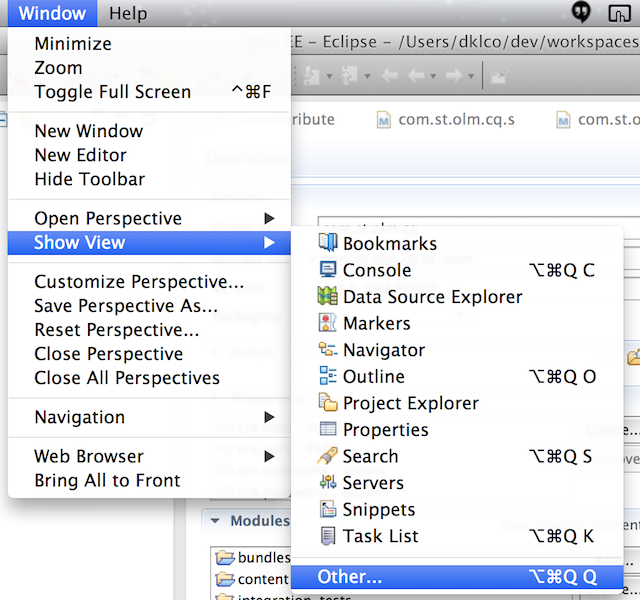 Once you have LogViewer installed and Eclipse has restarted, you can add it to you perspective. Simply go to Window > Show View > Other... to locate the LogViewer view and then add it to your perspective where ever makes sense for you. I would suggest the bottom viewport. Once you have LogViewer installed and added to your perspective, you can configure it. 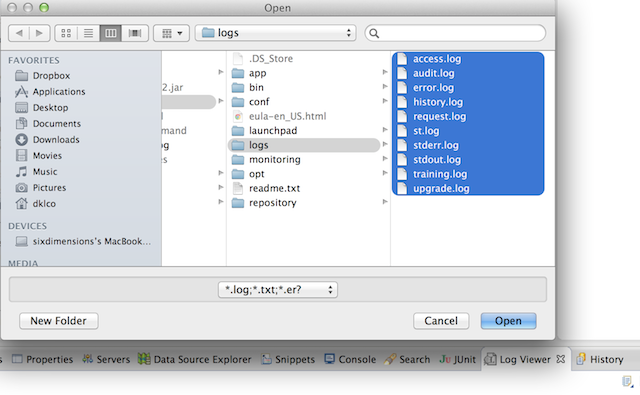 First, select the Open Logfile button to select the logs to tail. Next, go ahead and add some line highlighting to highlight errors and warnings, simply select the Show rule preferences button. 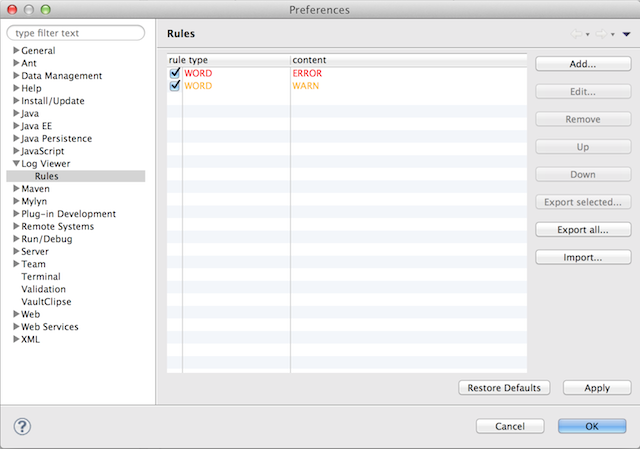 This will open the preferences dialog to set up line highlighting.